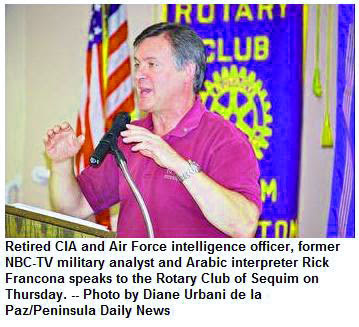 SEQUIM -- Rick Francona took Rotarians on a head-spinning tour of his own "axis of evil" and touched down on a problem people in Sequim -- and elsewhere on the North Olympic Peninsula -- can relate to. Israel occupies the Golan Heights -- a spine of border land along part of Syria -- because they provide access to the Jordan River, which Israeli farmers can't do without. "Water is their lifeline," just like "oil is ours," said Francona, who should know. A retired U.S. Air Force intelligence officer, he served in just about every nation in the Middle East, from Saudi Arabia to Syria to Iraq. In his 90-minute speech to the Rotary Club of Sequim on Thursday, Francona offered his opinions on U.S. involvement in Iraq, Iran and Afghanistan and on the Israeli-Palestinian peace process. And unlike former President George W. Bush, who labeled Iran, Iraq and North Korea the axis of evil, Francona considers Iran, North Korea and Syria more dangerous to global security. "Iran is the largest supporter of terrorism in the world, bar none," he said. And "Iran is intent on building a nuclear weapon," despite Iranian assertions to the contrary. "Syria is the ally of Iran," he added, so if one is attacked, the other will join the ensuing conflict. Across the Middle East, "everything is intermingled," with Syria and Israel locked in a stalemate over the Golan Heights, among other things. And while the international media do sweeping coverage of nuclear arms development, petroleum prices and terrorism -- again Francona should know since he was an NBC news analyst from 2003 to 2008 -- he seeks to boil things down to a human scale. The Golan Heights is a strategic position not just in terms of military buildup, Francona said, but also because if Israel gave them back to Syria, Syria could choke off Israeli access to the Jordan River. "They won't tell you that," said Francona. But "Israel has turned the area into a bread basket," an agricultural Eden with vineyards providing grapes for Israeli wine, among other products. To gain a sense of what life is like on both sides of the heights, Francona recommended the movie, "The Syrian Bride," about a woman who crosses over. Mona, the bride, lives in a Golan village and is engaged to marry Tallel, a television comedian who works in Damascus, Syria. Once they marry, Mona will become Syrian and never see her family again. Francona spoke next of what he calls the "Islam bomb." It's not a nuclear weapon, he said; it's the birth rate among Muslims. "Jewish families average two or three children," he said. "Arabs average seven or eight kids per family . . . by 2050 or 2060, Israel is going to be an Arab country because of the birth rate." After discussing Israeli-Palestinian strife, Francona worked his way over to Afghanistan. "[President Barack Obama] did the right thing by sending in 28,000 more troops," he began. "We're seeing more casualties because we're being more aggressive . 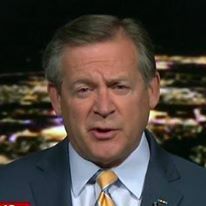 . . and I'm not an Obama fan, but he's done the right thing here, by killing the bad guys," and disrupting the al-Qaida structure in the region. "We still need to hunt them down," Francona added, now that al-Qaida operatives are on the move. Finally, he returned to Iran, which lies at the center of the region the United States still depends on to provide the oil that can stabilize prices on the world market. "We are fast losing leverage in that part of the world" because of our dependence on foreign oil, he said. Francona reminded the Rotarians of 1973, when they probably waited in lines at gas stations amid that era's energy crisis. Now as then, Francona said, what this country must do is come up with a coherent national energy policy. That, he believes, is the primary task before President Obama -- along with defusing nuclear-weapons development in Iran, disabling al-Qaida and dealing with the rest of the tangled Mideast web. Sequim-Dungeness Valley reporter Diane Urbani de la Paz can be reached at 360-681-2391 or at diane.urbani@peninsuladailynews.com. All materials Copyright © 2008 Horvitz Newspapers. Saudi Arabia's first coed university - really?